To try and get enough funds in order to continue animating, I've had to set up a separate channel following demonetization of my highasakoit YouTube channel. 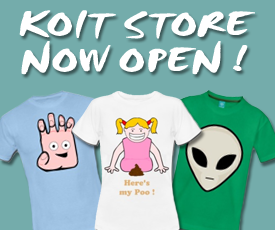 So please visit Koit On channel and subscribe! Trudy returns for her 8th Episode. This time, it's all about the romance. I keep strange company. Do you ? Have you ever had a lump on your head that's slightly nefarious ? The third and final part of the My Bum Goes (Fart Song) Trilogy.